It may surprise you to know that there are plenty of things to do in Las Vegas with kids on the Strip and off of the strip. 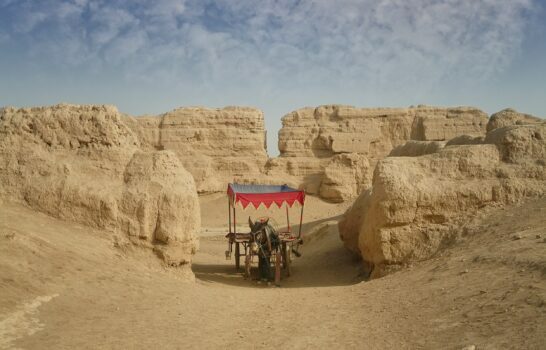 In fact, it can actually be a fantastic place for a family vacation that warrants longer than a weekend. Some of these activities are simply good to look out for should you happen to be in nearby while others are worth seeking out. Free is always good. Truth be told, not all of these items are worth going out of your way for. Keep them in mind though if you happen to be nearby. The Children’s Park at Town Square features a Pop Jet fountain splash pad, a hedge maze, a tree house and a bakery playhouse, among other attractions for kids. An 11-minute free show in the Forum Shops area, “Fall of Atlantis” features special water and fire effects and 9-foot-tall animatronic statues. Show times fall every hour on the hour. It has a reputation for being a little bit cheesy but kids like it if you happen to be browsing around in The Forum Shops. These iconic fountains are choreographed to music and lights. Depending on the day of the week and the time of day, the Bellagio Fountains run every 15 or 30 minutes. They are reported to have cost $40 million to build and contain 22 million gallons of water. Free to the public and open 24 hours a day, a Sky-lit atrium at the Bellagio features seasonal scenes of trees, flowers and other plants. The Conservatory and Botanical Gardens at Bellagio Las Vegas are redesigned four times a year to reflect each of the four seasons, as well as a special display for Chinese New Year. The Bellagio website says that 90% of the trees, flowers and plants here are recycled in celebration of the resort’s commitment to the environment. It takes just a few minutes to walk through it. A unique shopping mall in Downtown Las Vegas made from shipping containers, featuring boutique shopping and dining, at the center of which is the Treehouse Playground for kids, including a 33 ft. slide and NEOS play system. The Pinball Hall of Fame is a free museum dedicated to vintage pinball machines and has the world’s largest collection of pinball machines on display. It’s located on Tropicana near the former site of the now defunct Liberace Museum. At the CBS Television City Research Center, visitors can view and rate pilots for TV shows and other TV programs, and thereby perhaps have impact on network programming decisions. No reservations are required so simply walk in to get (free) tickets. Children must be at least 10 years old. The Mirage Volcano outside of the Las Vegas Boulevard main entrance of the Mirage hotel, this free live show is staged nightly at 7:00 p.m. and 8:00 p.m., and on weekends also at 9:00 p.m. The volcano “erupts” to lights, fire and music. Above a pedestrianized outdoor mall in Downtown Las Vegas is an array of over 12 million LED bulbs that are lit in unison to a variety of rock classics (and other music), resulting in a fantastic, famous, and free nightly light show every evening. The Viva Vision Light Show starts in the evening and runs every hour for six minutes. One of the best ways to see it is while on the zip line (details below). Across from Caesars Palace on the Las Vegas Strip, you can ride the High Roller Observation Wheel. At 550 feet high, it’s the world’s largest observation wheel and taller than the (similar) London Eye. Riders enjoy panoramic 360° views of the Strip and Las Vegas Valley. It takes about 30 minutes to complete a full rotation and is a very popular activity for those in Las Vegas with kids. The 360 degree views from the 460 foot high observation deck near the top of the half scale (541 foot) replica of the Eiffel Tower at Paris Las Vegas offer some of the best views of the city, as do the views from the glass elevator on the way up. The entire trip lasts about 30 minutes. Adventuredome at Circus Circus is a 5-acre indoor amusement park with rock climbing, bungee jumping, roller coasters (Chaos and Canyon Blaster), an arcade, miniature golf and more. Individual ride tickets vary from $6-$12. All-day ride passes are $19 if you’re under 48 inches tall, and $33 if you’re taller. You’ll buy them directly from Circus Circus. The Midway at Circus Circus is designed for kids and adults of all ages with its enormous selection of games and premium prizes for winners, including 200 classic arcade games. The Midway surrounds a circus stage featuring daily acts starting at 11:30 a.m. Here kids can step off the Strip and take a deep dive into the Marvel Cinematic Universe. A variety of superhero equipment and costumes from the “Avengers” films is on display under glass, including Iron Man’s armor Captain America’s shield, and Thor’s hammer. You can even purchase your own personalized ID at the Marvel Avengers retail store. The Big Apple Roller Coaster is the world’s first to feature a 180-degree heartline twist and dive maneuver. Over 1.4 million riders enjoy its heart-stopping action annually so perhaps this is best for teens. Below the ride is an arcade. The 15-minute ride under bridges and beside cafes in the Venetian hotel intends to evoke a similar gondola ride in Venice, Italy. They also have a gondola ride outdoors with views of the Strip. Electric-powered go-karts for kids and adults on an indoor track. Pole Position Raceway is located about 2 miles from the Las Vegas Strip. Wet ‘n’ Wild Las Vegas is a water park located in Spring Valley, about 11 miles from the Las Vegas Strip. It’s closed during the winter. Indoor skydiving right now is all the rage, so it’s no surprise that it can also be done just off the Strip. Participants will go through instructional training, gear up and spend 3 minutes suspended over a wind tunnel. Cowabunga Bay is a seasonal water park with slides, a wave pool and a kids’ area. Their website has a monthly calendar of events and days it is open. Slotzilla Zip Line is a slot machine inspired zip line at the Fremont Street Experience. The lower “Zipline” is 77 feet above ground and the higher “zoomline” is 114 feet above ground and sends riders flying superhero-style. GameWorks Modern Arcade is an arcade and sports bar located on Las Vegas Boulevard South in Town Square Mall. They have 100 ticket redemption, video and classic arcade-style games, 8 bowling lanes, 2 pool tables, 30 televisions in addition to a new Dark Ride XD ride with real-time 7D graphics, motion, light and sound. Adventure Canyon at Buffalo Bill’s is not in Las Vegas, but rather about 40 miles south in Primm, Nevada. Drivers to Las Vegas from Southern California will likely pass it along the way. Popular rides include the Adventure Canyon log ride featuring a 35-foot drop and the Desperado roller coaster. The theme park is open Fridays, Saturdays and Sundays only. Vintage Neon signs, some very large from old casinos and other businesses in Las Vegas, are displayed outdoors at the Neon Museum and Boneyard over a 6-acre site. The general public can visit the museum only via a guided tour, which the museum urges visitors to pre-book due to demand. As some of the signs still light up, night tours and late night tours are also available. Closed-toed shoes are advised due to broken glass and rusty bits in the boneyard. At Mandalay Bay, the Shark Reef Aquarium has over 2,000 animals, including giant rays, sea turtles, piranha, and a golden crocodile. Kids can also join their animal Encounters program and feed stingrays, sharks or turtles. My daughter loves it and it takes about an hour to tour it. It’s one of the nice toddler activities in Las Vegas. The Las Vegas Natural History Museum is a private, nonprofit museum located in downtown that features exhibits on dinosaurs, the natural wildlife of Nevada, the Treasures of Egypt (mummies), geology, and more. It also offers a Young Scientists Center where kids can dig for fossils or explore the ocean depths inside a submarine. The Discovery Children’s Museum is home to 9 exhibition halls with 58,00 square feet of exhibits dedicated to science,, art and culture. Permanent exhibits include Eco City, Toddler Town, Patents Pending, water World, and more. It’s located in Symphony Park, adjacent to The Smith Center in downtown Las Vegas. Kids can get up close to lions tigers, leopards and even dolphins at the Secret Garden and Dolphin Habitat named for the legendary Las Vegas magicians, Siegfried and Roy. 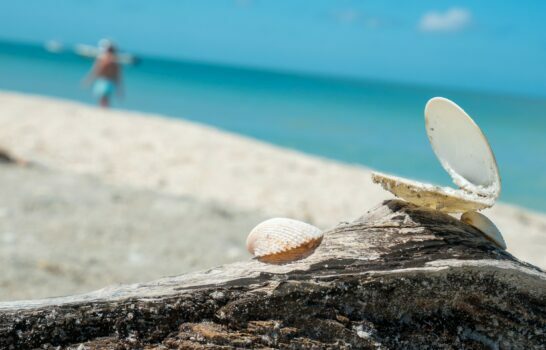 It’s also possible to participate in special experiences here such as becoming a dolphin trainer for a day, painting with dolphins, and even yoga with dolphins. It has achieved certification by the American Humane Conservation program for animal welfare. The Las Vegas location of Madame Tussauds at the Venetian features wax recreations of dozens of celebrities, including some of interest to kids such as the Avengers or maybe Katy Perry. On its website, the Aquarium at the Silverton says it’s been named the “Best Free Attraction in Las Vegas.” Its 117,000 gallons of water hold thousands of tropical fish and even live mermaids that interact with guests. The staff marine biologist will answer guest questions while under water (due to a full-face communication mask) during interactive daily feeding shows. Check the website for times. Lion Habitat Ranch is a lion sanctuary located in nearby Henderson, just minutes from the Las Vegas Strip, that features about 40 lions and a giraffe. Visitors can go behind the scenes and even feed the animals. It’s home to the original MGM lions. Exhibits at the Seaquest Interactive Aquarium feature sea life, rainforest reptiles, tropical birds, and more. Kids can feed, interact with and even hold hundreds of creatures from all over the world. It is even possible to snorkel with stingrays. Located in the Las Vegas Valley, the Las Vegas Farm has been open to the public since 1968. At the arn, kids can interact with chickens, peacocks, ducks, a goose, turkeys, goats, pigs, horses, cows, a mule, a llama, rabbits, cats, tortoises, and more. It is possible to feed some of the animals. The farm produces eggs and honey, which it sells in its market. There is also a broader farmer’s market offering seasonal vegetables and fruits, as well as breads, jams and more. The Las Vegas Farm is about 20 miles from the Las Vegas Strip. The Atomic Testing Museum showcases the history of nuclear testing at the Nevada Test Site north of Las Vegas. It’s a museum in association with the Smithsonian Institution that has a number of collection-based exhibits and learning activities all ages will love. Railroads may not have quite the same appeal to kids as they did in the 1960s, but there is still an allure for many. The Nevada State Railroad Museum is about a 25 minute drive from the Las Vegas Strip. Here, you can ride in an old train along a portion of the same track that originally brought supplies to build Hoover Dam. At the Excalibur, the Tournament of Kings in a 900-seat theater-in-the-round, immerses the dinner-and-a-show audience in the tales of knights of King Arthur, including special effects and pyrotechnics. During the show, guests eat a three course meal: with their hands! 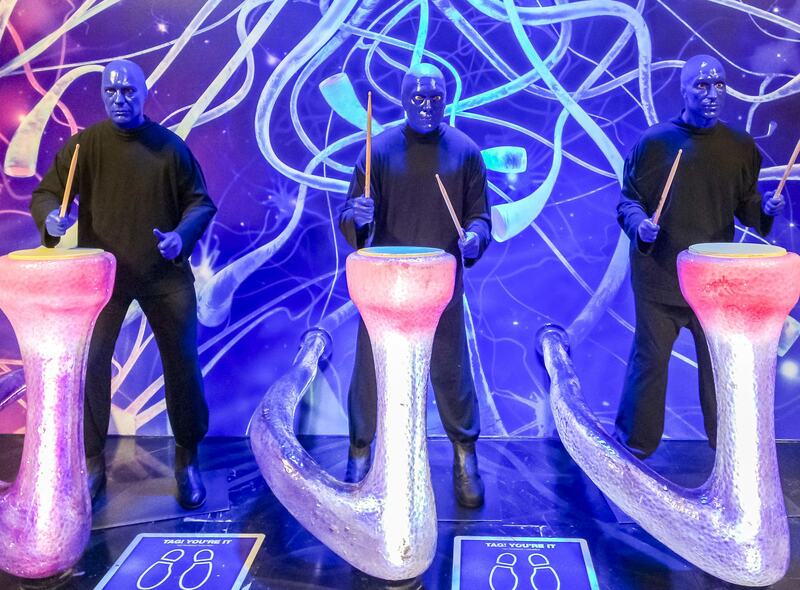 The world-famous comedic music show features a cast of performers painted blue. It is by far my 10-year-old’s favorite Las Vegas show and I’d recommend the poncho seats or seats nearby as they’ll shoot toilet paper and things into the section. The show is at the Luxor Hotel & Casino. Presented exclusively at Treasure Island, this Cirque du Soleil show has been named “Best Production Show” in Las Vegas eight times by the Las Vegas Review-Journal newspaper. The classic aquatic “O” by Cirque du Soleil show at the Bellagio Las Vegas features acrobats, synchronized swimmers and lots of water. At the Luxor Hotel & Casino, 13 preserved human bodies and over 250 organs are displayed in an educational context. Here, kids (if they are not squeamish) can marvel at how intricate our muscles and organs are in addition to learning a little bit more about what happens if we don’t take care of our bodies. Located at the V theater at Planet Hollywood in the Miracle Mile Shops, Gregory Popovich’s Pet Theater is a kid-oriented comedy show featuring pet tricks that is fun for all ages including toddlers. 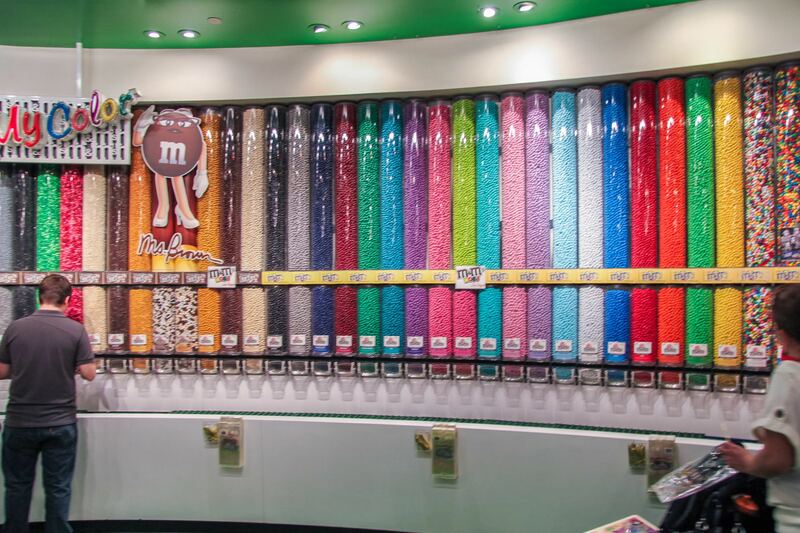 Located near the MGM Grand Casino & Hotel on the Las Vegas Strip, M&M’s World is four floors that celebrate all things M&M’s candy. Seemingly endless varieties of the classic M&M’s candy are sold here along with toys, clothes and other M&M’s souvenirs. Located in the New York, New York Hotel & Casino, Hershey’s Chocolate World is a 2-story, 13,000-square-foot flagship store that showcases over 800 Hershey’s chocolate and candies, and also offers store-exclusive gifts, products and treats. Kids can customize their own candy bars and even star in a Reese’s peanut Butter Cup commercial. The store features a sculpture of the Statue of Liberty made entirely of chocolate. Located in the Showcase Mall just north of the MGM Grand on the Las Vegas Strip, the Coca-Cola store itself celebrates the iconic Coca-Cola, a soda known worldwide for generations. A snack bar there offers an “Around the World” option where for $7 you can get a 4 oz. portion of 16 different sodas and drinks from around the world. Enjoy a self-guided viewing aisle at the Ethel M Chocolates factory and a chocolate shop in Henderson. It’s free to enter but you can take a chocolate tasting class for an additional fee. 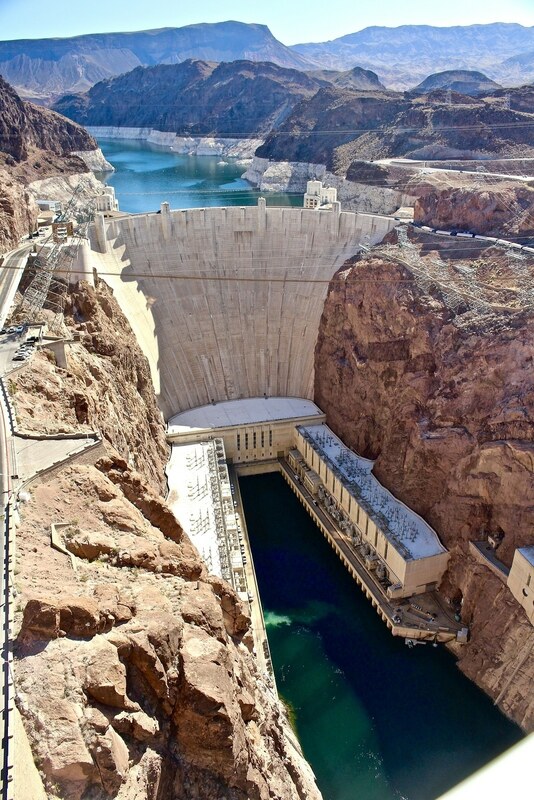 A visit to the Hoover Dam is an excellent day trip from Las Vegas filled with edutainment for all ages. It’s one of the seven engineering wonders of the modern world and straddles the Arizona-Nevada border. Tour the power plant, take photos from the observation deck and more. There are myriad of ways to tour the Hoover Dam from private guides to bike tours. For example, multiple tour companies offer helicopter tours of the Grand Canyon and/or Hoover Dam (with various add-ons, if you like), departing from and returning to Las Vegas. Just 25 minutes or so away from the Strip is gorgeous Red Rock Canyon National Conservation Area. It features a scenic 13-mile drive, internationally-renowned hiking trails and unique geology including rock formations that have formed over the past 600 million years. Particularly notable is the 7,068-foot Mount Wilson. Red Rock Canyon is where many go to take a break from the neon. Springs Preserve is a 180 acres of land featuring nature walks and displays located approximately three miles west of downtown Las Vegas. Also featuring other daily events detailed on their website. For visitors who are not Nevada residents, tickets are $10.95 for kids and $18.95 for adults. Lake Mead is both on the Colorado River and a National Recreation Area managed by the National Park Service. Here outdoor enthusiasts can enjoy sport fishing, kayaking, canoeing, picnic areas, desert scenery, desert hikes, and even the opportunity to see the Hoover Dam. It’s about 24 miles from the Las Vegas Strip. The highest peak in Clark County, Nevada (which includes Las Vegas), Mount Charleston offers mountain hiking and modest, seasonal skiing. There are two popular discounted attractions passes for Las Vegas attractions. Which you choose depends on the length of your visit and which attractions you’d like to see. The Las Vegas Pass offers free entry, and sometimes expedited entry, to over 60 Las Vegas attractions for 1, 2, 3 or 5 consecutive days. Pass holders may enter each attraction once. One of the most popular discounted bundled attractions passes is the Go Las Vegas Card. You can buy it as an All-Inclusive pass (saving up to 60%), an Explorer pass (choose 4, 5, 7 attractions and use the pass within 30 days from first scan), or Build Your Own pass and save 20% by adding just two attractions to the pass. The more attractions you add, the greater the savings will be. Show the pass on a mobile phone for entry. Las Vegas with kids is often easiest in a non-gaming hotel. Our preferred Las Vegas family hotels are these two luxury hotels. Four Seasons Hotel Las Vegas is by far the best family hotel. This is where we stay. 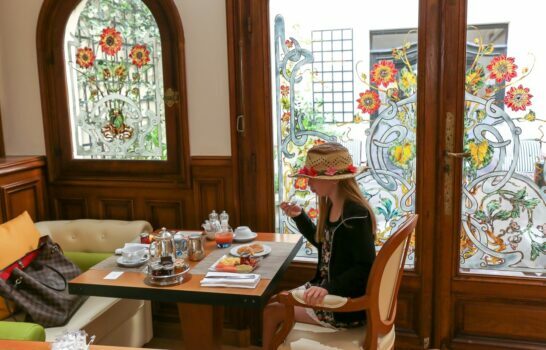 In addition to always-stellar service, Four Seasons properties worldwide are well-known for being welcoming to kids with various amenities at check-in, menus just for them and more. The pool area lacks the crowds and chaos that can be common during warm weather in Vegas. Absent are the sounds of slot machines, but it’s easy to simply step into the Mandalay Bay casino straight from the hotel elevator, if you like. We are also fans of the make-your-own donut bar at Sunday brunch. 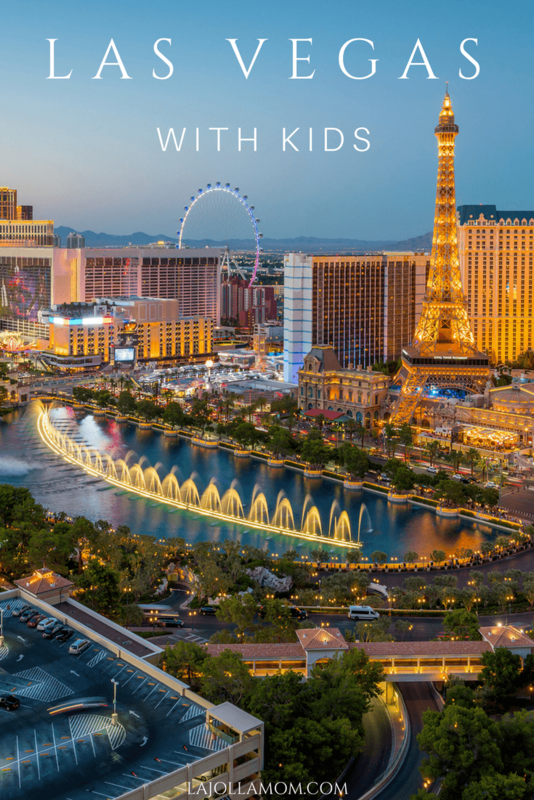 I have written a summery for Four Seasons of things to do in Las Vegas with kids that are easy when you stay at this luxury hotel. Tip: Search and book other Las Vegas luxury hotels with value-added Virtuoso benefits (at no cost to you) that may include breakfast for two, $100 resort credits, upgrades and more. 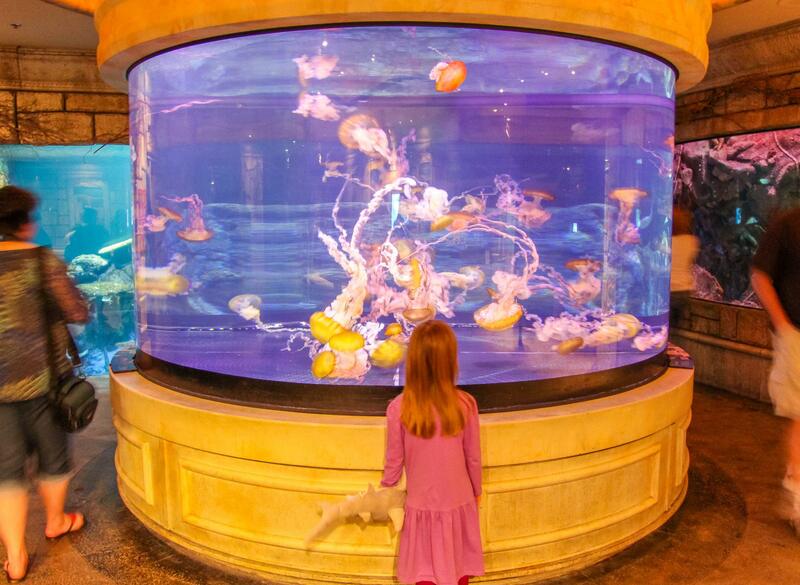 What are your favorite things to do in Las Vegas with kids? I loved this post since we JUST got back from a ten day road trip to California and back and made a detour through the Vegas strip. With our four kids in tow, we didn’t stop to stay in Vegas (didn’t think there would be a place to stay with them!) so we just cruised the strip. One thing I was looking for in your post, how do you get around the inappropriate billboards driving around on the trucks? I can avoid the card distributors and we’d obviously stay out the clubs, but those trucks are hard to avoid on the Strip. Ideas? How did you get around that or explain it? Interesting! We actually did not see any. It’s probably because we spent most of the time above street level and when we were on street level (at the M&M store) there was so much going on with the street performers, etc. that we probably didn’t notice the trucks. 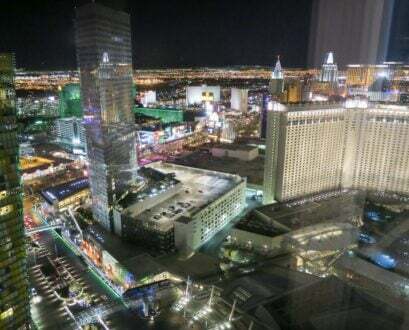 We stayed at the MGM Tower Suites – adjacent the hotel with no games and it was non-smoking. Felt good to escape all the craziness! We still toured the big casinos and watched the Bellagio, etc………..it is kid-friendly…….you just have to know where to go and what to do. Good tips, La Jolla Mom! Yes, that’s a good point. We normally travel by the seat of our pants but we did really look in to what she’d like and not. Even talked to the hotel Concierge in advance of our trip. Isn’t the non-smoking thing great? It made a huge difference walking through the casinos. At least Mandalay is non-smoking in the casino. I wasn’t paying attention to see if the others were too. I’ve always disliked Las Vegas (though like the outlying areas and natural areas), but I love Four Seasons, and had no idea they had a NON-GAMING hotel there. How wonderful! Will have to rethink my stance on this city, as we live one short plane ride away as well! This is a fantastic list! Really, there are a lot of activities and entertainment options in Las Vegas that the whole family can enjoy. I recommend Jeff Civillico: Comedy in Action at The Quad. His show is high-energy, very interactive, and perfect for all ages. Check out his website for showtimes and to learn more about the show: http://www.jeffcivillico.com/. Really glad to hear it! We are going back in November. I hear Verandah will have been updated by then so am looking forward to seeing the changes! Thanks for stopping by! Oh my gosh, we love going to Vegas with our kids too. Seeing a new show each trip is usually a highlight. It is amazing how many fun things there are to do there.